Comparative mask led how to choose a high-performance device? To treat acne, slow skin aging or tighten facial tissues, you can opt for a photomodulation treatment. The device is in the form of an LED mask. However, there are several criteria to consider when choosing the right device for your needs. Non-invasive, light therapy treatment can be done at home or in an institute. Each LED colour has a specific action on the skin. The LED mask is therefore a device designed to fight different problems of the dermis. It is therefore necessary to identify in advance the action you want to obtain in order to know which device to choose. Among the devices offered, not all of them have the same number of LED colours. Indeed, the models have 3 or 7 LED colors. The minimum, 3 colours, generally contains green for anti-aging care and slowing skin aging, blue to eliminate acne germs and red to stimulate collagen production and reduce wrinkles. The 7-color LED face mask is probably the most appropriate device when you want to treat your skin globally. It allows, by changing the colors, to act as a real painless lifting on the tissues. It tightens, plumps and erases unsightly spots on your face by simply exposing it for about twenty minutes per session. If you are looking for a complete treatment, you should choose this model. If you are targeting a specific action, the 3-color LED face mask may be sufficient. It is best to complete the facial treatment with the neck adapter in order to obtain a homogeneous effect. Light therapy acts on the dermis by exposing it to pulsed colour light for a specific period of time. Each treatment does not require the same exposure time or intensity. It is generally the green LED that will be used to erase pigment spots on the dermis, but also to erase skin imperfections. 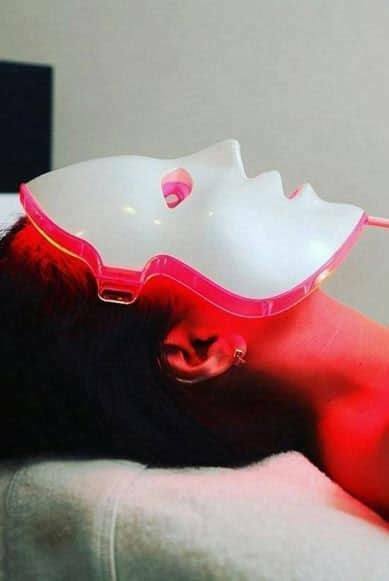 The anti-ageing led mask you choose must also be equipped with red light in order to have a plumping and healing action on your dermis. Indeed, it is not enough to remove pigment spots to have a baby’s skin. It is also necessary to repair tissues damaged by age and skin problems. Over time, the skin relaxes and collapses. It is therefore essential to combine the treatments to have an optimal tightening effect on your face. Think long-term when selecting your device. Acne is induced by germs that cause unsightly skin rashes. Many adolescents are affected by this problem with the hormonal change that occurs at their age, but this can continue into adulthood. Also, the anti-acne led mask is a painless and non-invasive solution that gently eliminates the bacteria responsible for pimples, unlike traditional, highly invasive treatments. If you suffer from this problem, you should choose a device with a blue and a red led. The blue will have an antiseptic action while the red will erase the scars left by the pimples. Some devices can also treat the upper body, as the rash can also affect the upper back, shoulders and chest. You will get visible results very quickly if your skin responds well to the treatment.